Today was yet another practice climb at the 777 Tower in downtown Los Angeles. And again, I did new best time. There’s nothing not to like about that. As always, I rode the train there after work. It’s so easy and pleasant. I got there a few minutes early, got signed in and ready to climb. This time, I went first into the stairwell. Everyone else there at the time said I would pass them, so they said I should go first. So I started up. By the time I was at 7 or 8, there was a guy catching up behind me. He came up right behind me at about 10, so I stepped to the side and asked if he wanted to pass. And he sort of croaked out, “I’m just trying to keep up with you”, so I went back to the inside and kept going. He shadowed me up to about 20 before he fell off the pace. I’d made up a card of split times aiming to be at the top by 8:10. I was on schedule at 10 and 20, but by 30 I was a couple seconds off. I also noticed one odd thing. from 30 to 40 I altered my normal stepping pattern in order to switch which leg was doing more work. And at 36, I suddenly found myself hitting the landing on the wrong foot. So the second flight between 35 and 36 had an extra step in it. I had to do a quick adjustment to get back on track, and I made a mental note to pay attention to that the next time up. When I got to 40, I was still a few seconds behind schedule, but I could see that I still had a chance at a good time. I started to wind it up at about 46, picking up the pace a bit, and at 48, I started a full-on sprint. 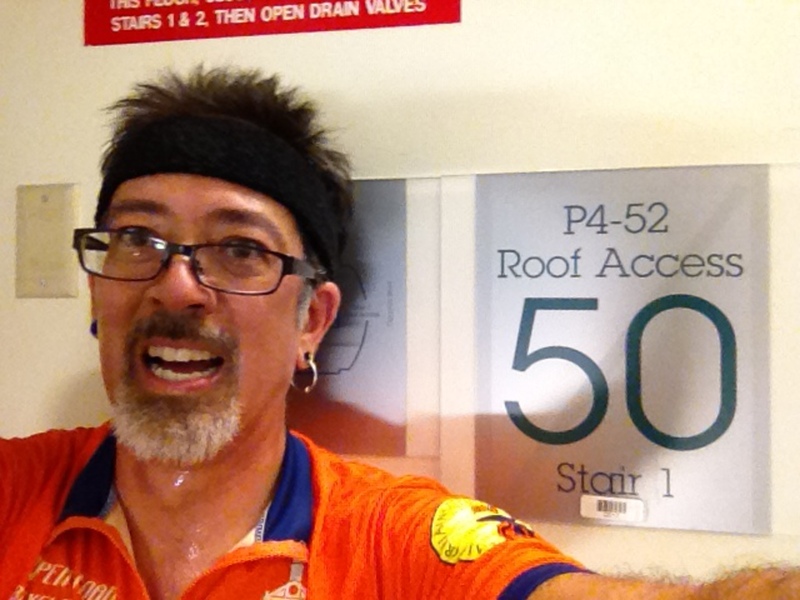 I ran the last two floors, and then did the traditional face-plant on the 50th floor landing. 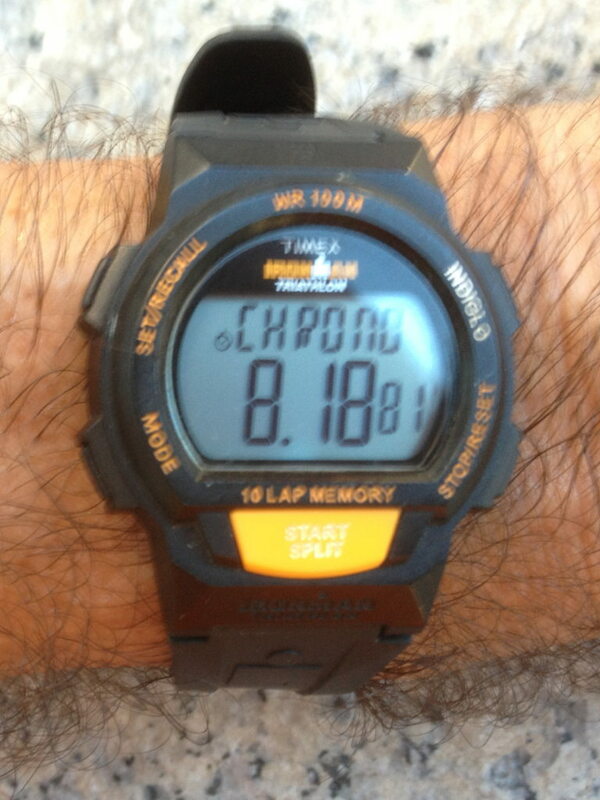 When I looked at my watch, I saw that I’d done an 8:19, which is a good four seconds faster than my previous best time. And I realized later that this marks the first time I’ve gone under 10 seconds per floor for a large building climb. After just a few minutes rest, I rode the elevator down and headed up again. The second time, I was planning on going slower. I paid attention, and I saw that, while most of the building is 23 steps per floor, divided into 12/11 flights, from 35 to 36 and from 45 to 46 are both 12/12. So I have to correct my chart for this building. Even going slower, the second time is a lot more painful than the first. 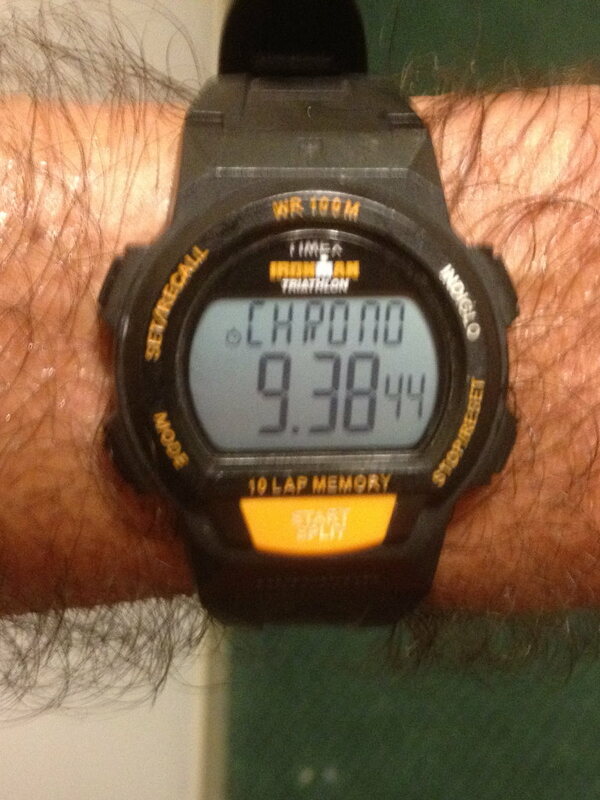 Still, I made it to the top in 9:38, which works out to about 11.2 seconds per floor. The first couple races I did, back in 2009, I averaged about 12 seconds per floor, and I felt like I was gonna die! So doing 11.2 when I’m not particularly trying to go fast shows just how much I’ve improved in this insane little sport. Overall, it was a fun evening.